Polyglots, by definition, are language lovers and learners whose identity comes from learning more than one language. They often find creative ways to learn, practice, and maintain their many languages. The incredible language learner, Elisa Polese, talks about how she’s developed her own method for teaching and learning multiple languages at one time and in one course. 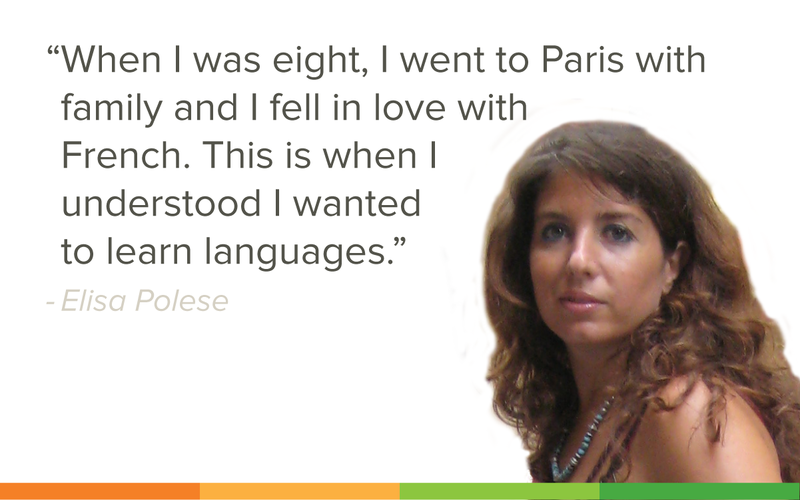 Elisa Polese is a polyglot and language teacher who has begun teaching languages in an innovative way. She believes in learning more than one language at the same time — no matter the similarity or differences between the two (or more) languages. In addition to learning multiple languages herself, she helps others to learn languages simultaneously through her unique courses. Although she's not the first teacher to come up with this idea, she is one of the few who advocate learning up to ten languages at a time (although she usually suggests five). Let's see how this passion for languages got started. Falling in love with languages. Elisa grew up in Naples, Italy, so her mother tongue is Italian. She first became interested in languages at a young age, when she visited Paris with her family. She immediately fell in love with French and began learning it in school. After French, Elisa started learning English, because she knew that it was an important language to know. She traveled a lot with her family while on vacations and as her career progressed, she was able to travel to many different countries for work. In addition to learning languages, Elisa enjoys learning about the cultures of the countries where the languages are spoken. Learning about a culture is just as important as learning the language itself. "If you speak a language without knowing the culture, you won’t be able to communicate effectively," Elisa explains. She talks about how in each country she has lived, different gestures mean different things. This is important to know so that you do not commit a cultural faux pas — or worse. But don’t let this scare you! Learning about a language’s culture is rewarding and can allow you to better understand someone else’s point of view. As with a few of our previous guests on the Mango Languages podcast, Elisa also believes that the term polyglot has changed its connotation, if not also its meaning. “To me, polyglot means to be open to other cultures and just having a passion for languages." Becoming a polyglot may have once sounded like an impossible title to earn. With the greats, such as Richard Simcott, who speaks over 30 languages and Tim Doner who was able to learn 17 languages by the time he turned 17, the polyglot community can appear to be intimidating. However, the polyglot community is no longer a club, but more like a movement made up of individuals who are passionate about language and culture. If you’ve not yet attended a polyglot event or even joined a polyglot Facebook group, we highly recommend it. The passion for language learning exhibited in these communities is infectious and inspiring, no matter where you are on your language-learning journey. Now, if you are already a polyglot and are looking for ways to amp up your learning, Elisa’s method for learning multiple languages in one course should supply plenty of challenge and language-related fun. Elisa has been teaching languages for a while. She began teaching exchange students at the University of Naples and then went on to also hold online language courses. More recently, Elisa began offering a course where you could learn more than one language at a time. Although there are some polyglots who advise against learning multiple languages at once, especially similar languages, Elisa promotes the opposite. She usually teaches Italian, French, and Spanish in the same course because of their similarities, especially when it comes to grammar. For example, if you’ve ever spent time learning Spanish verbs, you may know that it can take a while to get the conjugations down. It may take 20 minutes to learn Spanish verbs, for example. It probably takes just about the same amount of time to learn Italian verbs. However, if you learn either Spanish, Italian or French verbs first, it would take you less time to learn each of these language’s verbs. In essence, learning similar languages at the same time helps save time. Elisa’s method can be applied to any two (or more) languages, whether or not they belong to the same language family, for example, Spanish and Chinese. “You can always find similarities, so I think it is possible to learn any languages,” says Elisa. Just think how many languages you can learn if you use this method each year! Based on what she does with her students, here are a few activities that Elisa suggests to help you learn/maintain multiple languages at the same time. If you prefer to listen to content when you’re learning a language, you could listen to a podcast, authentic music, or watch a movie. Then, try to explain what you’ve heard/watched in another language. This can help to build your listening and comprehension skills in two languages at once! After training your language pronunciation and listening skills, you can amp this activity up a notch by listening to something in one language that you’re learning/maintaining and explaining what you’ve just heard in a different language you’re learning/maintaining. This activity can create many returns for your target language listening and comprehension skills. In fact, by completing this activity in two different languages, you’re killing two birds with one stone. Learning languages opens the door to other worlds. In Elisa’s case, she has found a way to enter multiple doors at the same time. We hope that her language-learning methods can help you to explore the many doors of the world and communicate with people whom you would not have been able to without the knowledge of a second, third, even fifth language. All you have to do is knock. If you'd like to learn more about Elisa and her method of learning languages simultaneously, you can reach her at multilingualcourses@gmail.com. Also, check out the full interview below! Ready to open a door to another world? Click below to discover if Mango Languages (which includes over 70 languages to choose from) is available for free through your library. Happy learning!